Join us as we remember the days leading up to the cross and the resurrection of Jesus. These times of gathering together will invite you to not only remember what Jesus did but also reflect on how you might live out the hope we have in Him today. April 18, Triumph Lutheran – East, 7 p.m.
Bethel Church worshipers are invited to attend the Maundy Thursday worship and communion service at Triumph Lutheran – East. 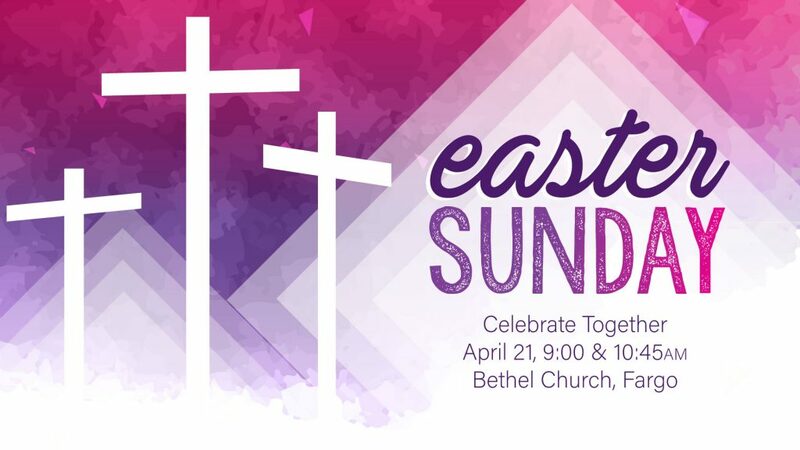 Triumph worshipers are invited to the Bethel Church Good Friday service the following day. Enjoy celebrating what God is doing in Fargo-Moorhead by participating in this special joint celebration! April 19, Bethel Worship Center, 6:30 p.m.
Good Friday is an important time to pause during Holy Week and reflect with gratitude on the magnificent work Christ accomplished at Calvary. Join us for a time of powerful worship surrounding the Biblical account of the crucifixion and remembering His sacrifice. 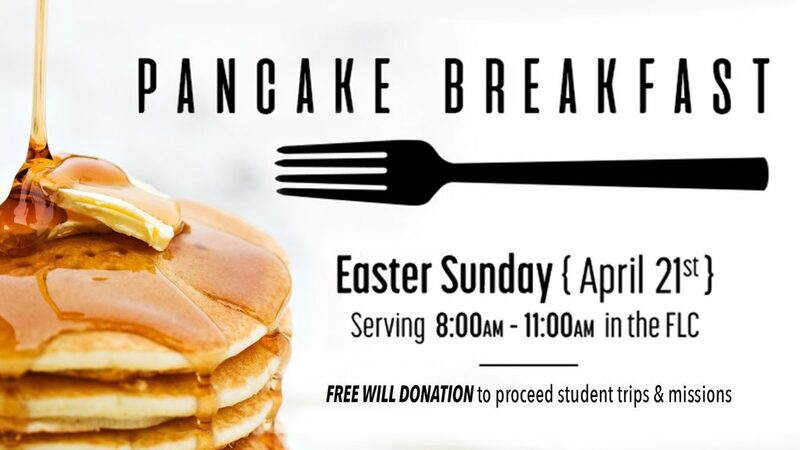 Our youth will be serving a pancake breakfast on Easter Sunday. If you like pancakes, eggs, and sausage then come hungry; we’ll have plenty! An opportunity to support the students’ summer trips will be available during the breakfast. Students will help cook, serve and clean. We will take a free will offering for breakfast. No rsvp or reservations needed, just join us in the Family Life Center for some pancakes! April 21, Live Worship in the Worship Center at 9 a.m. and 10:45 a.m.
Our Easter celebration service will also include a time of celebrating new life in Christ through baptism. Come and celebrate the many lives changed through receiving the good news of hope in Jesus. On Easter Sunday, there will only be Sunday School for Infants up through Bees (4 year olds). Activity Boxes will be available by the Worship Center doors for older kids. Please stop by the Kid’s Welcome Desk if you have any questions. Our Core Classes classes and Bethel Students will not meet on Easter Sunday. No college lunch on Easter, due to the holiday weekend. Are you willing to serve our congregation and guests Easter Morning? Please join our Easter Morning Parking Lot Ministry. Our parking lot ministry extends the ministry of hospitality into the church parking lot by answering questions, providing help as needed, and directing traffic before and between our Easter morning services. Please meet at the Information Center in the Foyer to receive your vest, parking lot assignment and a brief training. Calling all musicians! If you play an instrument or sing, but haven’t gotten involved with our choir or orchestra, Easter is a great time to do so! We are putting together a special ensemble for Easter this year and welcome anyone who wants to celebrate and worship with us! Contact Gretchen Barker at gretchenbarker@bethelfc.com for more information or to sign up! Please plan to attend rehearsals April 10 & 17. *Extra rehearsals may be brought up at a later date.